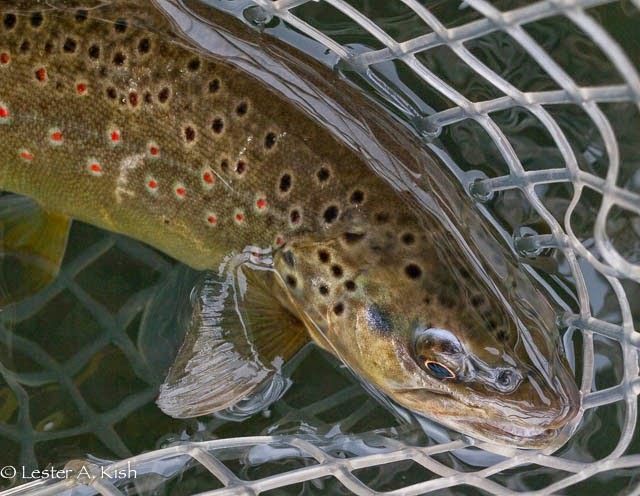 Does the sight of surface feeding trout quicken your pulse? How about the dainty rise of a midging fish. And what of the "toilet flush rise" or fish hurtling skyward like cruise missiles? I fished the other day, started the day nymphing half-heartedly. But once I noticed some sporadic rises, the jig was up. No more nymphing for me. It was dry fly leader time. Time for a midge cluster and midge pupa too. I cast. Cast again. Threw in some slack. A fish rose. I snubbed it. The process was repeated, several times. Same results. After educating these few fish, the pool got quiet. At least I got a couple to eat. It was time for an exploratory walk to look for heads. I eventually found a few more risers. Patient sippers they were, their rises barely disturbing the surface. 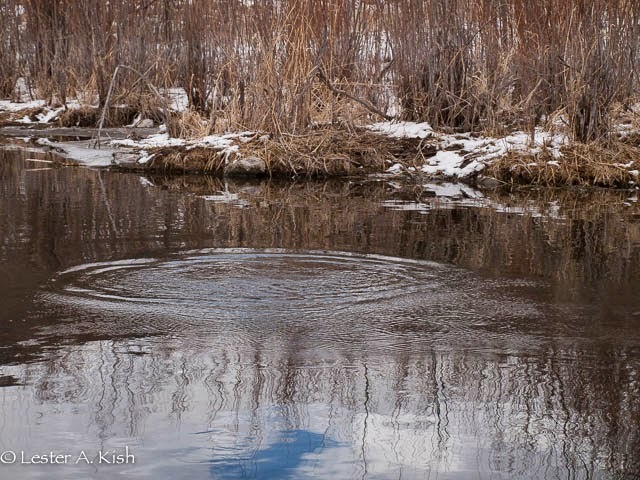 But, there was that occasional explosive rise, with fish leaving the water completely. What could cause this? A large mayfly drifted by. I fumbled to strain it from the water with my fingers but missed. It drifted from view. Somewhere downstream there was another explosive rise. The fish were clearly excited by the prospects of a larger meal. 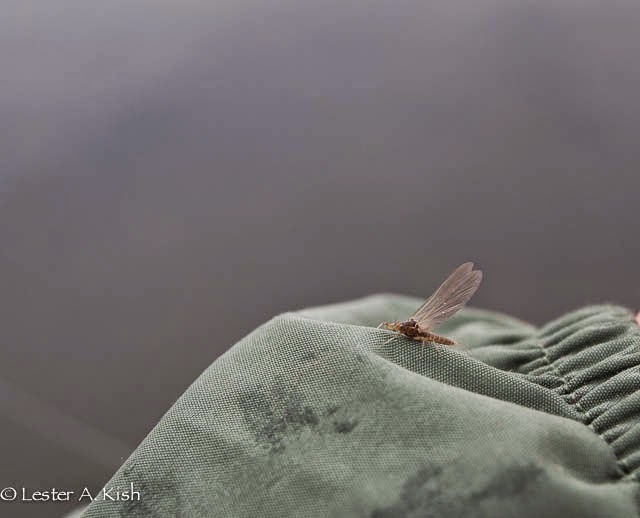 Another mayfly hopped and flip-flopped on the surface while trying to dry its wings and take flight. I caught this one, admired it. An early blue-winged olive. A size fourteen? Sixteen? No matter, it sure wasn't a twenty-two. After a winter of few midges, small ones at that, it looked huge. I'd forgotten how big the wings can make a mayfly look. Now, I'd tied a bunch of patterns this winter in anticipation of hatches to come. Nice ones too I might add. Thoraxes, parachutes, hackle-stackers, half-back emergers, cripples. A veritable cornucopia of blue-winged olive imitations. Only problem, I'd left my dry fly box at home, on the fly tying bench. Now who needs dry flies, in February, in Montana? Word of advice, tied flies fish best when in the immediate possession of the angler. Scratch that onto next years must have list. Put flies into vest. Luckily, I had a few crudely tied blue-wings weaseled away. A whitefish grabbed the fly, inches into the first float. Then several trout followed. Another whitefish. More trout, browns and rainbows. This day, the stream generously shared its bounty. I couldn't keep the fly afloat, which is why I really dislike CDC. Big problem I know. Cuss the fly that catches the fish. I just can't seem to squeeze the fish spit from the fly in order to revive it and make it floatable. Know what? The fish ate the sunk fly too. Sometimes even a slight resemblance of the real hatch will attract and in your case that day the blue wing was magic. I have learned fishing for trout is sometimes a hit or miss, but this day was your hit-------congrats, colorful trout!!! Bill, it was one of those rare days when things just worked out. Overcast, calm, about forty degrees. There weren't many bugs, but the fish were on them. I forgot to tell you about my bird dogs I use to own, they were two liver and white pointers. I can still see both those dogs working a field. Once bird hunting gets in your blood it never leaves. I know you can relate. Thanks for sharing Bill. How about posting about them pointers on your blog sometime? Looking forward to it Bill. Les; Enjoyed the rising fish post. 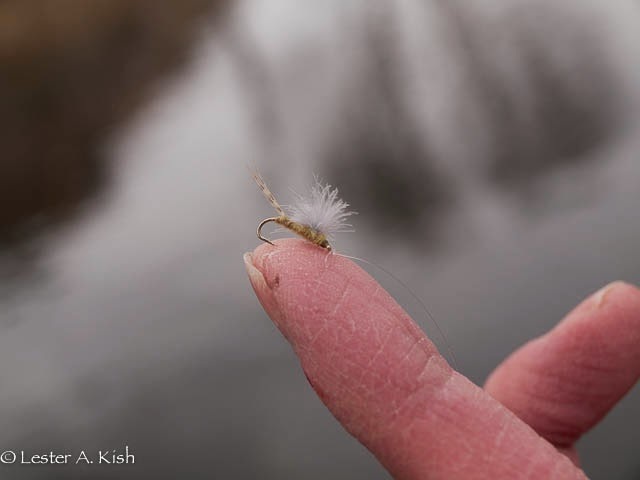 It got me thinking about the upcoming season and surface feeding trout.Sounds like you had an amazing dry fly day, especially considering it is February (envious). CDC is a great material but I have the same problem with it; difficult to revive. I find it especially problematic on rich water that is soupy like spring creeks/ tailwaters as it doesn't even take a caught fish to get all slimmed. It does work wonderfully sunk: emerger. I still use it sometimes in dry flies but mostly tie same patterns with polypro: white, grey, black...and use the different colors depending on light conditions/visibility...durable and easy to revive...inexpensive, easy to handle when tying...a little heavier and doesn't land quite as softly but a fair exchange. Sometimes those early and late season opportunities(rising fish) are brief and it drives me crazy when I spend a lot of time trying to get cdc to float again. Thanks for the input Bob, I was hoping that you would check in. I like the idea and look of CDC too. For dry flies, not so much. Yes to poly. It's easy to work with, and floats well. Ever used snowshoe hares' foot? Les: Yes, I have and still do create some flies with it. Discovered it when I lived back east and fished the Adirondacks. Would go and buy some flies off of Fran Betters on Ausable river. He tied a series of simple flies he called Haystacks, basically forerunner to comparadun. He also tied this simple effective fly with snowshoe hair as wing, also on tail,I believe called: the Usual. Ed Engle, in his book, tying small flies, has a pattern he uses snowshoe hair on I believe he calls the "weapon"...same fly as Betters but I don't believe gives him credit which is simply an oversight as he always seems to give credit to others in his books. I still prefer polypro for my small flies and many patterns have hackle. I still have to read about your float. There's so many variations of dun patterns out there. Being new to the dry fly game I'm still trying to sort out out which style might be most effective. They have to look good, fish well, and be visible (emphasis here) to this angler. I've debated adding the "Usual" to my fly box. I watched Mike Lawson tie "Duck-quill No Hackles" a few years back. Boy, I wish that I could "tie like Mike." Again, thanks for your insight. Yes, for me also visibility is the key. If I can't see it then can't fish it well. And, yes there are so many patterns. I keep to 3 or 4 fairly simple styles, basically same ones as you, for any hatch and often fish the one that shows up best in the light conditions. I have tied no hackles but am not good with that pattern, so stay away...but what a match and a beautiful fly! I'm sure Lawson ties great ones. Thanks for the dry fly inspiration, Les. Hopefully I'll be back at it soon, when this wickedly cold NY season is done with. Enjoyed the read. Most welcome Walt. Someday soon the bugs will be popping in your neck of the woods too. Funny thing, I lucked out and got to fish on the one nice, warm, calm day that we've had in the past couple of weeks. Just for posterity, midges were hatching along the Madison today. Even saw some small stoneflies crawling on the snow. Didn't fish, just hiked. A nice bright day, temp barely made it to freezing. Great post Les. Can't wait for some open water here in Maine..still locked up solid.. Thanks Mike, hopefully you'll see some ice free water soon.